The seaside community of Bolinas is the oldest town in coastal Marin. It is separated from the North American continent by the wildlife rich Bolinas Lagoon (kayak and canoe friendly), and the infamous San Andreas Fault line. Bolinas is actually not part of the American continent as it’s located on the Pacific plate. …with only one road in, it’s not quite an island, but a community with an island sensibility. Finding Bolinas is part of your adventure: Turning left at the head of the lagoon, approximately 4.5 miles North of Stinson Beach, will take you to this once secretive village. With technology and on-line maps, the secret is out, though you still won’t see a sign indicating where to turn left from Highway One. This shouldn’t discourage visitors from straying off the beaten path and visiting this charming and eccentric village. But, be aware that the beach is small, parking is very problematic and residents prefer a quiet and private lifestyle. If you find your way there, the community is friendly. Consider taking public transportation (the Stage Coach) or bringing your bike or good walking shoes and park in the large auxiliary dirt parking lot owned by Mesa Park, located on Mesa Rd. next to the Firehouse and Health Clinic and then biking or walking using the newly created bike/pedestrian path (easy to moderate, as there is a bit of hill on the way up – approximately a 1/8 mile hike) which links the Mesa to Downtown Bolinas. Be aware that Bolinas is a local-dog friendly town and local dogs are often free and unleashed. We recommend bringing only well-socialized dogs to Bolinas as there is no leash law. 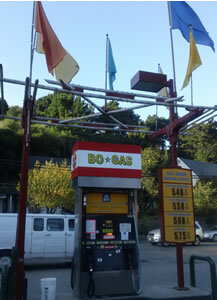 « Bolinas has one of the few gas stations on the West Marin coast, BO Gas. The history of Bolinas is steeped in self- sustainability. The indigenous Coast Miwok people thrived here in a landscape of astounding natural abundance. The first non-native settlers were Spanish Californians on their spectacular Mexican Land Grant that defined the boundaries of Bolinas until Stinson Beach became a separate town in 1916. But it was the Gold Rush that defined the land’s fate. Thousands of gold seekers poured into the little village of San Francisco creating an insatiable need for lumber and food. Proximity and easy schooner access of the Bolinas Lagoon brought loggers to the surrounding primeval forests. Today, as you look up from Bolinas to the Mt. Tamalpais ridge, you can see result –ancient redwood forests replaced by flowing grasslands. As busy schooner traffic between Bolinas and San Francisco served as the gateway to commerce for West Marin, the town grew around Wharf Road, today the downtown hub of Bolinas. Many schooner captains saw the fertile landscape of Bolinas and soon their ranches started an economy and community that defined the town. That tradition of producing good food began in 1834 and has continued into the 21st Century with outstanding Bolinas ranches and organic farms. Bolinas boasts roadside farm stands and local products sold in stores featuring fresh local produce. Bolinas’ organic farms have received international attention as models of sustainability, and the variety of organic food available from vegetables to fresh crab and fish, bread and eggs, local desserts and cheeses are a foodies’ dream. The 1960s and 1970s were pivotal decades for this area, as savvy activists saved Bolinas, the Lagoon and the surrounding area from massive development that included four-lane freeway and luxury marina. In 1971, a dramatic struggle to rescue sea birds after a devastating oil spill attracted an influx of counterculture young people. Many stayed, purchased homes, became involved in the local community through volunteer efforts on the School Board, the local Water Board and other nonprofits and were instrumental in securing the future for Bolinas today. They brought controversy, lasting innovation and ultimately a community commitment to environmental preservation and individualism. From the beginning Bolinas always attracted independent minded and creative people. Among its residents are families whose roots go back to the 1800s, organic farmers and an inordinate number of accomplished artists, writers, musicians, scientists, and entrepreneurs. Protected by surrounding national and state parks and nature preserves, Bolinas residents, visitors, hikers, bird watchers and nature lovers appreciate the natural beauty and wildlife of this landscape. From a Prince and a President, surfers to shamans, Bolinas welcomes all manner of visitors, but they do request that visitors respect their desire for privacy. Bolinas is the birthplace of the internationally active Point Reyes Bird Observatory, and is a bird watchers paradise. Besides the two public access beaches near the downtown area, there is a County Park with a tennis court, free and open to the public with public restrooms, a new Downtown Park opening in 2012, Agate Beach, which contains ample parking and extensive tide pools that are protected as part of the Gulf of the Farallones National Marine Sanctuary. The town also hosts the Marin-Bolinas Botanical Gardens, and borders on the Point Reyes National Seashore to the north. The historic downtown buildings were mostly built between 1850 and 1920 including the saloon that has been in business since 1851(they claim to be the oldest in California!). The grocery store has changed little since it was rebuilt after the 1906 earthquake. The gas station was opened in 1906 as a livery stable and converted to a full service gas station in the 1920’s. Bolinas shops offer excellent variety for such a small village, including one of a kind items made by local artisans, art galleries, a hardware store with sundries and even pet supplies, surf rentals, sales, lessons and summer surf camps, a natural food store, comfortable clothing, world-source gifts, books, a café which emphasizes local fresh food, an organic smoothie lounge with home-made baked goods, the only gas station between Mill Valley and Pt. Reyes (open 24 hours with a credit card or debit card – critical if you misjudged your gas use), and an outstanding fine arts museum with an exhibition gallery and an exhibit space featuring artifacts and photographs devoted to the fascinating history of the town. Downtown Bolinas is a lovely place to stroll and shop, people watch and picnic. It is unique in that so many of the downtown buildings are non-profits providing services for local citizens that enhance the community’s economic viability, while still maintaining a vibrant visitor’s corridor. From the gas station that is owned and operated by a local nonprofit that provides affordable housing (the Bolinas Land Trust), the Community Center with adult and children’s classes and events including music, plays and film, the Library, the Bolinas Museum and the three community parks, this small enclave is known for its connectedness to the land that surrounds it and for supporting the diversity of the people that live and work in this very special village. There is a small 4 room motel and various B&B and vacation rental options for lodging. Please note that there is NO camping or fires allowed in Bolinas and this is enforced seriously for the health and safety of the community. Bolinas: An on-going experiment in diversity, volunteerism, sustainability and cooperative attitudes, and a true West Marin destination.